One of the great promises of IP video surveillance systems is network convergence - Using the company's IT network to carry data, voice and IP video surveillance together. Claimed benefits included reduced costs, greater reliability and simpler maintenance as a single network replaces multiple networks for IT and surveillance applications. Mega IT companies like Cisco have championed this for years. Unfortunately, converged networks turn out to be more myth than reality in the real world. 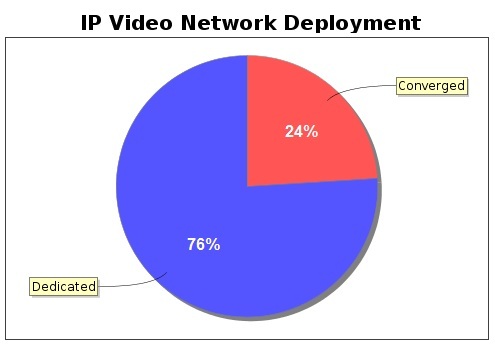 76% of integrators in our IPVM Survey report that they most commonly use dedicated networks for IP Video Surveillance while only 24% reuse / integrate with the existing company network. "IT manager concern about bandwidth"
"Due to bandwidth constraints our IP video solutions are not normally allowed on a corporate network and thus we have to create our own dedicated security network." "Bandwidth and collision / problem avoidance"
"Customers do not want large amounts of video traffic on their company network. Nor do they want the security risk." Convergenced network proponents will be quick to point out how cheap and easy it is to deploy gigabit networks. However, the reality is that existing network infrastructures built over the last decade are often not at those levels and it can be hard for the surveillance integrator to simply change out or forklift upgrade the existing network. "We drive them to a dedicated network due to the bandwidth requirements involved since existing company networks are usually poorly setup (they are most of the times a flat network) without the possibility to handle our traffic." "It is just way too much load for most of the existing network structures, to accomodate all the bandwidth requirrment on IP video." "It is very common the customer doesn't have a very reliable network. Often, we prove them that the video surveillance system will exceed the installed network's performance." "Predictable network performance. No concerns that cameras are going to bog when accounting department is hogging the network to run month end/year end reports. No mysterious perormance issues created when IT guys decide to kill the QOS settings for the video system, change out switches, steal POE ports"
"Keep our system stable and reliable as often the clients existing network is not suitable for running any form of security (reliability/robustness)." "Because they didn't have a strong IT staff or their IT staff said their network wouldn't handle it." Again, theoretically modern IT networks should be able to handle this but the reality that integrators are pointing out is that real networks are often far from ready or capable of adding in IP video surveillance. "Eliminate concerns of IT personnel." "Avoid issues with the person in charge of the network"
"Less interaction with the customer's IT department"
"Dealing with IT departments sometimes can turn into a nightmares." "Don't like sharing - having to work with the IT guy"
"We seldom work with IT departement if we can help it, and if we have to they prefer as we do seperate network." "Most of the time IT does not want it on their network"
"No issues dealing with IT guys, no hold ups when dealing with Ops guys who have to get permission from IT guys." "Usually IT departments prefer it." Over and over again, integrators expressed concerns about the real world problems of dealing with the IT department. "Don't mess with the customer's network"
"Customers will blame you for network issues." "Keep our system stable and reliable"
"There could be accusations of degraduation in the quality of the voice." "We usually drive the decision as we like to have control over the design and support of the network"
"I really try to push the dedicated network if the budget allows. It is mush easier for us to manage and it helps define where our scope start/stops." "Less liability and finger pointing when it comes to warranty support." "We don't want our system affected by outside influences, makes it easier to troubleshoot and more reliable." "Would rather not get involved with customer equipment for liability issues." While many networking specialists will emphasize how easy it is to build networks that are capable of converging data, voice and IP video surveillance, critical logistical issues get in the way. Sure, if a network can be built from scratch today with IP video designed in from the ground up, it might be 'easy'. The problem is integrators are mostly dealing with messy, existing systems with legacy infrastructure in place that causes significant challenges.